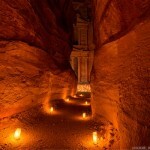 Petra is the “rose red city, half old as time”, and is the most popular tourist attraction of Jordan. The location was featured in Spielberg’s Indiana Jones and the Last Crusade. 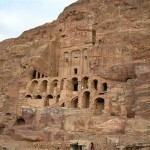 Petra was the impressive capital of the Nabataean kingdom around the 6th century BC. 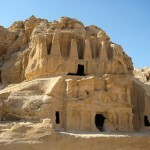 After the Roman conquest of Petra, the city continued to expand until it was ruined by a catastrophic earthquake in the 7th century AD. Much has been written about Petra, the city carved in the sheer red rocks, but nothing can really prepare you for this stunning site. 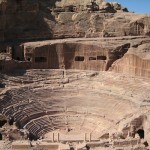 The Arabs that settled the city 2000 years ago turned Petra into a meeting place of various trade routes, which linked the Far East with Syria, Egypt, Greece and Rome. The entrance of the city though the Siq will give you the first glimpses of Al-Khazneh. 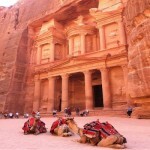 There are two modes of transportation around Petra – you can walk or rent a pricy camel, donkey or a horse. If you decide to visit, avoid the winter months, when it is surprisingly cold and the site may be closed if the rains start to flood the valley.